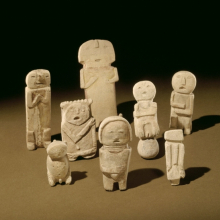 These eight figurines were found inside a ceramic vessel near Sanders, Arizona, but the context of the discovery site is unknown. Their facial features, thin arms, and angular postures point to a Mimbres origin. Similar stone figurines have been discovered in the region in a variety of archaeological contexts, including a burial, a domestic room, and a trash mound. The open mouths suggest some form of communication and the objects’ small size indicates personal use, but questions remain: Were the objects used for rituals, burial offerings, or as treasured possessions? Were they discarded after one use? The Pamí’wa, commonly referred to as the Cubeo, live in the present-day countries of Colombia and Brazil and are known for elaborate dance masks made of painted bark cloth. These full-body masks are worn for the mourning, or ónyo (“weeping”), ceremony, a multiday ritual held approximately a year after an individual’s death. The masks represent the spirits of primordial animals who were created by the deity Kúwai at the beginning of time and were prototypes for real species. 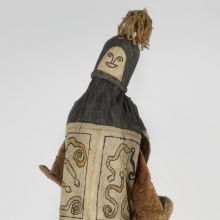 Made and worn by men, the masks do not come alive until they are danced, thereby creating a connection between ancestral and present-day worlds. Geometric designs are more common on such masks than the snakes depicted here, which may represent the spirit Ala, a venomous viper. This extraordinarily complex mantle, or cloak, is one of the most renowned Andean textiles in the world. It was most likely used as a ceremonial object. 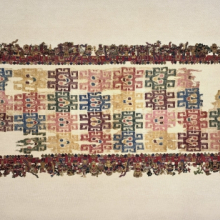 The ninety figures decorating the border, created by needle knitting, have been interpreted as a microcosm of life on Peru’s South Coast two thousand years ago, with a particular focus on agriculture. Many of the images illustrate native flora and fauna as well as cultivated plants. 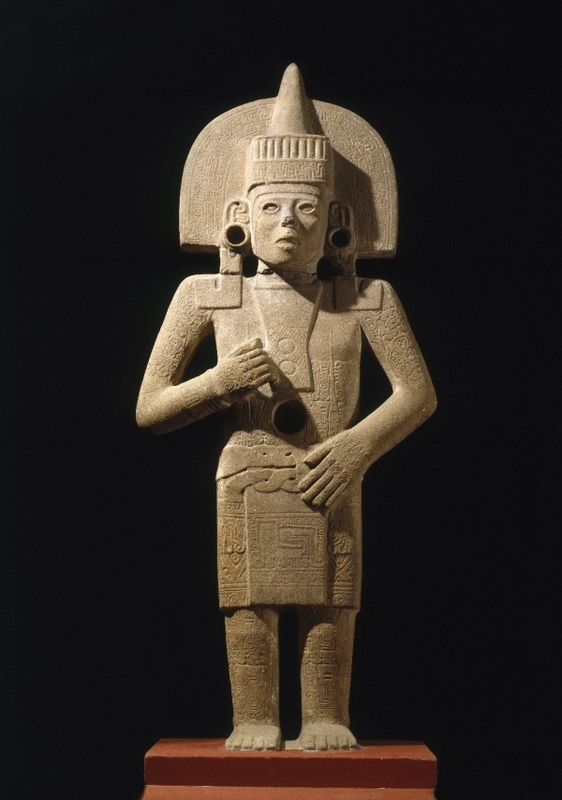 Costumed figures may represent humans impersonating gods and acting as intermediaries between the real and supernatural worlds. Severed human trophy heads are shown as germinating seeds, suggesting the practice of ritual sacrifice and the interconnected cycles of birth and death. 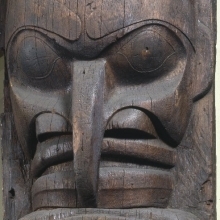 This house post, part of a set of four and owned by the Heiltsuk eagle clan of Yálátli (Goose Island), depicts the following creation story. In the beginning of time, many inhabitants of the land were animals and supernatural creatures. Some could take off their fur and feathers and assume human shape, while others remained in their supernatural form. One day a supernatural eagle, with the face of a man and an eagle’s beak, saw a whale in the water and seized it for his food. After a mighty struggle the eagle flipped the whale over and began to devour it, spilling the whale’s intestines into the water, where they became Yálátli Island. The eagle decided to live on this island, becoming human and taking the name Wígvilhba (Eagle-nose), which was passed down through generations to the Wígvilhba Wákas Chieftainship, today held by Chief Harvey Humchitt. Skull imagery is usually associated with the Tánis (Hamatsa) ceremony practiced by the Heiltsuk and Kwakwawa’wakw people. Young males are initiated into the community during a four-part ritual in which they are symbolically transformed from flesh-eating cannibals, a state equated with death, into well-behaved members of society. The skull thus symbolizes the rebirth of initiates as they come back from the dead. 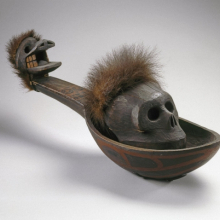 Skull items such as this one are sometimes used during the final stages of the ceremony: ritual feeding of the skull possibly by special ceremonial spoons such as this precede a ceremonial meal for the initiates. NOTE: Portions of this installation may be off view. Life, Death, and Transformation in the Americas presents over one hundred masterpieces from our permanent Arts of the Americas collection, exemplifying the concept of transformation as part of the spiritual beliefs and practice of the region’s indigenous peoples, past and present. 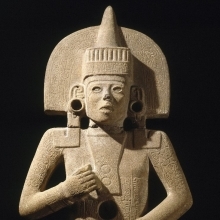 Themes of life, death, fertility, and regeneration are explored through pre-Columbian and historical artworks, including many pieces that are rarely on display. Highlights include the Huastec Life-Death Figure, the Kwakwaka’wakw Thunderbird Transformation Mask, and two eight-foot-tall, nineteenth-century Heiltsuk House Posts made to support the huge beams of a great Northwest Coast plank house. Other featured objects include Hopi and Zuni kachinas, masks from throughout the Americas, Mexica (Aztec) and Maya sculptures, and ancient Andean textiles including the two-thousand-year-old Paracas Textile, which illustrates the way in which early cultures of Peru’s South Coast envisioned their relationship with nature and the supernatural realm. Among the twenty-one objects that have rarely or never been on public view are a full-body bark-cloth mask made by the Pami’wa of Colombia and Brazil, a Maya effigy vessel in the form of a hunchback wearing a jaguar skin, and two contemporary kachinas by Hopi carver Henry Shelton. Life, Death, and Transformation in the Americas is organized by Nancy Rosoff, Andrew W. Mellon Curator, Arts of the Americas, Brooklyn Museum; and Susan Kennedy Zeller, Associate Curator, Native American Art, Brooklyn Museum.